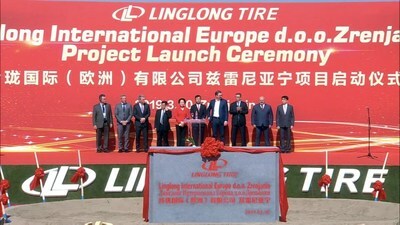 ZRENJANIN, Serbia, April 1, 2019 /PRNewswire/ -- From March 29 to 30, 2019, the first European factory of the Chinese tire industry, Linglong International Europe D.O.O. Zrenjanin (LLIE), held its launch ceremony and global partner conference in Serbia successfully. Serbia is China's first strategic partner in Central and Eastern Europe and has a favorable environment for development and investment. LLIE, located in the free trade zone of Zrenjanin, is the second overseas project of Linglong Tire and also the largest foreign investment project in Serbia at present. After the completion of the project, the annual output of various high-performance radial tires will reach 13.62 million units, with annual revenue of USD 600 million. Wang Feng, Chairman and CEO of Linglong Tire, said at the conference that, "Linglong's arrival in Serbia is a great opportunity given by the openness and win-win of times. We will live up to our expectations, ensure the rapid and high-quality construction of the project, strive for early production, and at the same time, Linglong will strengthen cultural exchanges and integration with Serbia, aiming to contribute to the establishment of a healthy, stable and sustainable economic and trade cooperation between China and Serbia." With a history of more than 40 years, Linglong Tire has been competitive in the international market in terms of technology R&D and product quality, and has been actively implementing its international development strategy and continuously promoting the "5+3" global layout. Linglong Tire has established production bases in domestic Chinese cities, such as Zhaoyuan and Dezhou in Shandong province, Liuzhou in Guangxi province, Jingmen in Hubei province and the first overseas factory in Thailand. The project applies emerging technologies such as artificial intelligence, mobile sensing, big data and industrial robots to integrate fine management, excellent quality, green manufacturing and high-end brand into one, and build an intelligent, automatic and green tire factory, establishing a benchmark for high-end intelligent manufacturing and green supply chain system. The construction of LLIE will further help Linglong to develop the European market and improve the timeliness of supply and service quality for European automobile factories. Additionally, it is of great significance for promoting the industrial layout of Linglong globalization and promoting the global influence of Chinese tire manufacturing.